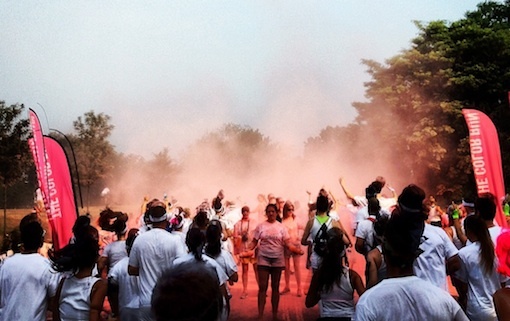 Here's what happens when you throw a lot of colored cornstarch at a lot of Philadelphians. By Courtenay Devlin·	 7/9/2012, 3:23 p.m.
Where can you find a two-year-old in ski goggles, a bride and her ‘maids (plus the cutest flower girl you’ve ever seen), and 26,000 other Philadelphians dressed all in white on a Sunday Morning in July? Three words: The Color Run. That’s exactly where I was yesterday morning at 7:20 a.m., with a sleepy boyfriend/personal photog in tow, ready to have the time of my life. James and I before and after the race. 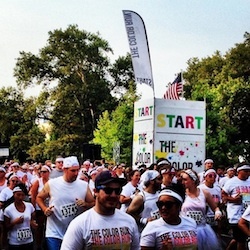 If you haven’t heard of the Color Run, you’re probably living under a rock. For the uninitiated: The Color Run is a 5K where race volunteers blast—and I mean blast—colored cornstarch at participants as they run through color stations set up at every kilometer. I should mention that this powder is 100 percent natural and safe. At the end of the race there’s a Color Extravaganza finish festival where everyone takes the color packet provided in their race bag and explodes it into the air. At least, that’s how it’s supposed to happen. 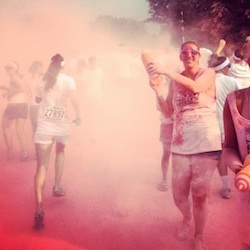 I first heard of the run back in February when a friend of a friend blogged about her experience running the Color Run Dallas. Then I started seeing it popping up everywhere, especially on Facebook. (Props to the Color Run’s marketing team for their social media push.) Before I knew it, everyone was talking about the Color Run, and just like that the Philly race was sold out—pretty good for a race that just began its national tour in January of this year. 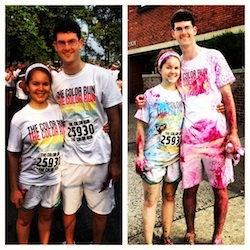 Despite some ups and downs, all in all, the Color Run was a great way to spend a Sunday morning. Other then the oppressive heat, registration on Saturday afternoon was a breeze. The website recommended that participants pick up their race bib and bag of goodies on Friday or Saturday to make Sunday morning less stressful. We stopped by the tents that were set up on Eakin’s Oval in front of the Art Museum and picked up our race bibs, T-shirts, Color Run Sweatbands (! ), color packets (I got fuchsia) and temporary tats. The atmosphere was fun with music blasting and peppy volunteers making sure everyone was happy. Even though there was a crowd, registration took just 15 minutes. To preface, I am an early bird. Because of the oppressive weather on Saturday, I had no qualms about getting up at 5 a.m. on Sunday morning to check if the run was still on. It was; the excessive heat warning miraculously ended at 6 a.m. 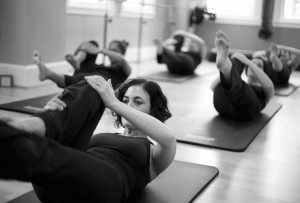 I was too antsy to wait around until 7 a.m. so I did a good hard workout (now you definitely all think I’m crazy) before waking everyone else up. I’d convinced my boyfriend, James, to do the run with me, and brought my parents along as chauffeurs/cheerleaders. Unfortunately, not everyone who lives in my house is as perky as me in the morning. It took some serious convincing to get everyone out of bed at 7 on a weekend morning, but with visions of the Color Run dancing in their heads (and incessant phone calls/texts from yours truly) they got up. We were out the door and down to the start at the Art Museum by 7:20. We hung around the finish line festival until around 9 a.m. and then headed home, caked in color. It was nice have the rest of the day ahead of us to do as we pleased (once we showered), so the early start was much appreciated. A bunch of overly excited teenagers, young parents pushing goggled toddlers in strollers, a few ambitious costumed Buzz Lightyears (begging the question: why?! ), and at least two bridal parties. Judging by the amount of pep in everyone’s step, you’d forget it was 7 a.m. The wave start window from 7 a.m. to 8 a.m. was a great way to relieve any stress a runner usually has about not getting to the start before the gun goes off. There were waves of 2,000 runners that started every five to 10 minutes during the hour so we mingled a bit before hopping into a wave that started around 7:30. Since people were going at all different speeds on the course, it wasn’t long until the walkers in my wave were overtaken by the runners and joggers from the wave after. In fact, this took place right around the first color station, and since it was so crowded, we didn’t get color blasted very well because of the chaos. Attention race organizers, here is your solution: Inform runners to start in earlier waves and walkers in later ones so no passing of waves occurs at the oh-so-vital color stations. Note: If you’re aiming for a PR, this is not the run for you. Time is not the purpose of the Color Run. Looking like a rainbow barfed on you is the purpose of the Color Run. There were no timing chips to tie into shoelaces and I did not even see a clock at the finish line. 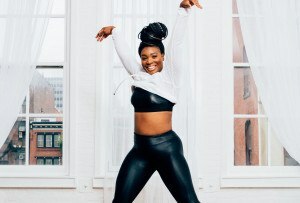 For a girl (me) who once ran so many races that racing, and running in general, was no longer fun, I thought this was such a nice change of pace. With the crowds, actually running the course was nearly impossible; however, we saw some smiling faces of runners at the finish who looked like they truly had a blast. The Color Run website clearly states that walkers are allowed and welcome on the course, so anyone who had planned on running should have considered themselves forewarned. We decided to just go with the flow and went on a leisurely Sunday morning walk (with an explosion of color thrown into the mix). It took us around 50 minutes to complete the 3.1 mile loop that started near the Art Museum, went up around Lemon Hill, crossed the Schuylkill at Girard, and went back to the museum on West River Drive. Well, I really didn’t have much to compare the “color-ness” of a race to so I’ll have to say this was a one of a kind experience. 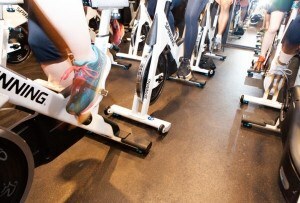 There were four color stations along the course, going from pink to blue to orange to yellow. When we went through the color zones, volunteers that were literally caked in their respective colors sprayed colored cornstarch directly at us. It was easy to ‘personalize’ your color by walking directly at the sprayers or avoiding them. I wanted blue so I got a lot of blue. Orange, not so much. Nearing the end of the run, the color stations were turning into one big colored powder cloud akin to a dust storm but a little more pleasant, I would imagine. Although the powder didn’t hurt my eyes or anything, it was hard to see three yards in front of me. Everything was just so, well, yellow. Quite the surreal experience. After the last station blasted us with color, people began exploding their color packets in the crowd. (This was flat-out rebellion. The packets specifically said to wait until the finish line festival to open. Just sayin’.) I got hit in the face with some purple (and found some in my ear this morning). It complemented my blue and yellow ensemble nicely. The finish line festival was a mix between a high school dance and a rave. There was lots of music, lots of dancing, and tons of color. We brought towels to sit on for the drive home. I can only imagine how SEPTA looked after the race with the amount of people that must have used public transport. It took some serious scrubbing with hot water and lots of soap but I got most of the color off of me in the shower. My white clothes all came clean after one go through the laundry. The black Nikes that I wore are now yellow, but they were old so I couldn’t care less. I spoke to John Connors, the Philly race director, about the cleanup of the city. He said that the Color Run teamed up with the City of Philadelphia to clean up not long after the race was over. They steam-washed the steps of the Art Museum, which haven’t looked so spankin’ new in the history of ever. The Color Run has already been invited back for next year. If I were you, I’d sign up fast. >> Click over to Page 2 to see lots more photos!